← 457 "The Greatest Story Ever D'ohed"
Captain Lance Murdock drives by on his motorbike and shouts "Yeehaw!" "American History X-cellent" is the seventeenth episode of Season 21. "When stolen paintings are found in Burns' manor, Mr. Burns is arrested, so he has Smithers take over for him at the nuclear plant, but when he starts working the employees night and day, they try to get Mr. Burns back, even if it means breaking him out of prison - which it does; Bart and Lisa bond over one ant that survives an accident involving Lisa's ant farm." Mr. Burns celebrates the Fourth of July in his typically despotic way - by using his workforce as slave labor for a picnic. He’s unimpressed by their efforts, which leads to a bitter Lenny, Homer and Carl getting drunk in his wine cellar and destroying his study. When Burns calls the cops, they focus not on his employees but on the fact that he possesses art stolen in an infamous (and taken-from-real-life) heist from the Isabella Stewart Gardner Museum in Massachusetts. 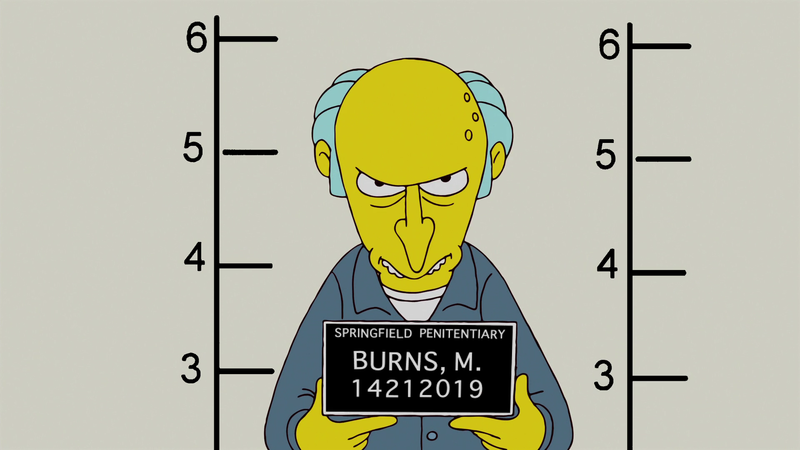 Burns tries to bribe his way out of jail but ends up behind bars, where he changes his ways due to the influence of a fellow inmate, and by influence meaning literally dragging the evil out of Burns and eating it. Mr. Smithers is placed in charge of the plant in his absence, where he initially proves an improvement over Mr. Burns. Unfortunately, he catches Homer, Lenny and Carl mocking him behind his back at the bar, resulting in him turning into a tyrant and the three friends launching a mission to spring Burns from the jug. Meanwhile, Bart and Lisa, left to their own devices because Homer’s so busy at the nuclear plant, reluctantly team up to care for an ant farm; when a fight between them results in all but one of the ants being eaten by Santa’s Little Helper they take special care of Annie, the sole survivor, and must decide between letting her live out her dotage in the wild or keeping her in captivity. However, just when they leave Annie in their backyard, Santa's Little Helper eats it. The episode was written by Michael Price and directed by Bob Anderson. "American History X-cellent" was viewed by 5.649 million viewers and a 2.7 rating and 8% share in the 18-49 demographic tying with last week's episode. Modified on September 18, 2017, at 15:53.